We're still feeding our honeybees, helping them sock away some extra honey to make it through the winter. I've been giving them really strong sugar water (half sugar, half water) to make it easier for them to dehydrate the liquid into honey in the cool weather, but that seems to make the bees exceptionally thirsty. At the same time, I poured out our kiddie pool of water since it's too late in the year to be soaking mushrooms. The combination of factors sent the bees searching for other water sources, and we started finding drowned bees in every standing body of water around the farm. Guilt-stricken, I set up a water feeder by filling a pie pan with marbles and then water. 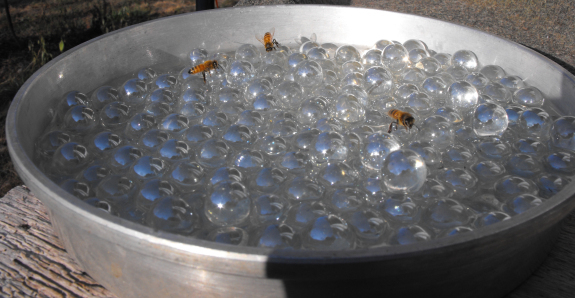 The marbles give the bees a spot to land so that they don't drown when they come to drink, and the bees were suitably impressed. No more drowned bees! Check out our ebook about how to make money at home. I'm ashamed to say, we got them at Wal-mart. I think they were in the floral section, meant to be used in vases as a decorative element. I suspect that if you start looking online in flower arranging type areas, you might find some like them! Always glad to help! I hope they're still selling them --- I think they'd been sitting in our barn for a year or two. My favorite way is to use an empty Mason jar, remove the cap, fill the jar with sugar water (4 table spoon of sugar for each 2 ounce of water completely dissolved), cover it with napkin already folded twice, then cover it with a plate. Inverse the whole thing and leave it on a table out there. If you insert a small pin or needle between the jar and napkin, it will allow more juicy water out while still control the flow. Skeptic --- that sounds like a good, low budget solution! I wouldn't add the sugar, though, unless your bees are in extreme need. We try to just leave enough honey for the bees so that we don't have to feed them the less nutritional sugar water. We have had trouble with our 'girls' having pool parties in the dog's water dish. I am out there multiple times daily fishing out bees, drying and warming them and then releasing them to return to their hives. I have tried other set ups, including a chicken waterer, but still they drown and many return to the dog dish. Your bee waterer looks like a perfect solution, and is charming to boot. Nicely done! Megan --- Glad to help! This waterer should solve your problem, and is definitely easy to build. Just be careful with any standing water in bowls, etc. The West Nile is going crazy at least in north Dallas counties. Are these glass marbles or are they watering Beads (that swell when you add water)? I do the same thing except I use pea gravel in mine. Everybody --- Fun to see so many of you dropping by this old post! To be honest, I didn't leave the waterer out long enough to really test whether it would get mosquito problems. After a week or so, I needed my cake pan back --- we can only go so long without deep dish pies. But I didn't see any larvae during that time, despite not cleaning it, which makes me suspect that since there's no real standing water, the mosquitoes didn't parse this as a safe place to lay their eggs. I'll be curious to hear from anyone who tries and does or doesn't get mosquito larvae in their waterer. Sheila --- These are glass marbles, from the exact same spot Trish mentions below. The bees at my house love the concrete bird baths, especially the small one. They can grip the concrete. Sugar water sounded like a great idea but was concerned about the sugar so did a bit of reading and gleaned enough to realize that if bees need sugar water then the keepers will do it and only under certain circumstances. Nature lovers want to help but there are times we need to be careful. Kirsten --- You're right on track. We try not to feed our bees sugar water, although we do have to from time to time. I consider it junk food, good only for emergencies. This is a great idea and I am not sure if Michael stores in the US has glass marbles or not. Another idea is the glass pebbles that are sold for flower arranging. I know that we have both in the Michael in Canada has both. Also we are able to find both the pebbles and marbles in dollar stores. We do the same basic concept for our butterfly house, Flying Flowers. My difference is we use a terracotta saucer and I use river rock and just enough water for them to get a 'drink'. We have since started doing this for the bees in the garden too. So much better than fishing them out of our birdbath etc. Thanks for sharing. I picked up a 5 gallon plastic. food-grade pail, (courtesy of our local donut shop) filled it with water and floated several dozen real styrofoam packing peanuts on the surface for the bees to land on. To make it easier for the girls to climb out, lean a straight stick or board from inside the corner of the bucket and they can climb back out and fly away. I don't understand putting sugar water out for honey bees. What's the logic of that? James --- Now and then, as a beekeeper, you have to feed the bees sugar water. For example, a new package needs some food before they've got their feet under them enough to forage for their own, and you sometimes have to feed them after a drought so they'll stock up enough honey for the winter. But I wouldn't do it if I didn't keep bees and know the state of the hive. use small rocks instead of the marbles. When several large Banks Roses were removed from close to a brick wall, I discovered that I had bees "living" in the space between bricks in the wall behind my house. There were hundreds on either side of the wall around the one space during spring......an increase over several months from winter. The Rosemary bushes attracted them, as did a few other plants. I've had them buzzing around those bushes for years w never a problem, they never bothered me as I worked in the yard amongst the bushes---I did talk to them tho! Anyway, after 3 weeks out of town, they were mostly gone upon my return...now summer is here with it's horrendous heat in the 100's---So. NV. I have a pool, tho see no drowned bees. 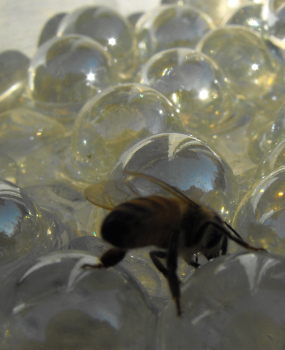 I'm wondering if I should make a bee waterer in the hopes that they will return. Maybe they've gone elsewhere? ps..I have photos of the bees when the mound on either side of the wall was about 2-3 thick of bees all group together---it was fascinating & a bit intimidating at the same time! I dont have a bee hive but I like honey bees in my garden for polonating the plants and they are becoming endangered because of pesticides, but my question is I have alot of wasp which I dont like, dosnt the Bee water attract them as well? Midge --- We haven't noticed wasps at our bee waterer, but you probably would if you followed one of the recommendations in the comments of using sugar water. With plain water, we seem to only attract honeybees. On the other hand, I like wasps. They do have a painful sting, but don't seem to harass me unless I accidentally squash one. And in the meantime, wasps do a great job of ridding the garden of pest insects. Don't forget, wasps have a use too! I would be really careful to not use an aluminum dish. It will leach into the water, especially in the hot sun (not great for humans either). Glass is by far the safest and can be bought at the dollar store along with the marbles. Our beekeepers guild recommends floating champagne or wine corks in a bucket of water or bowl etc. It's a better surface for honeybees to get traction on with their little legs. If you use old corks, cut off the wine stained section so they are "clean" corks. I admit your version is a very pretty option though. I use dinner plates for the same thing. Just plates with 1/4 of sugar water. I put the all over and change the places just a bit. They do need to be refilled sometimes as many as 4-5 times a day. I am very allergic o the stings and just move very slowly. You can also put the plate on a pizza pan to drown the ants who visit! I think that is such a great idea. May I suggest organic sugar. I'll be adding this to my garden. I have a small shallow bird bath that would be perfect for marbles and sugar water. And decorative. Its a win win for all. Oh this is definitely an amazing idea! Most dollar stores have marbles or dragon tears which would work as well. Now I know what to do with the various marbles and such I cant bring myself to just throw out. I wonder if it matters what color they are or will the bees just figure out where the water is? I'm sure that if you replace the water even every couple of days it wont matter if skeeters lay eggs, it takes some time for them to even hatch and the water will be changed by them. My guess is that problem will be more that they will dry out quickly and you would have to keep an eye on it to keep it supplied. A stupid question I am sure, but I must inquire. The sugar used is all natural, organic sugar cane, yes? no? The poop-free water jug is wonderful also. Here along the Sacramento river bee keepers have hundreds of hives that they move around from orchard to orchard. In the barren times and in my meager way to help them I have found that the bees truly prefer RAW sugar. I just got some coconut sugar and will test it out after the rains subside. How does one create one of these nifty bee waterers and keep it from becoming overrun by ants?? I cannot even hang a humming bird feeder out because no matter where I hang it, the ants will find it and then no one else can use it. Great idea. I have not seen mosquitoes yet in this Winter that won't make way for Spring. We use mosquito dunks in bird baths and fountains when it is mosquito season. I had actually considered this! I think it's an excellent idea, HOWEVER, I would caution you all to look for glass marbles without any kind of iridescent paint on them (as those pictured). Who knows what kind of paint is used on them and lead could be an issue, not to mention other contaminants. Someone asked about what to do about ants on the waterer and also on the hummingbird feeders. I would put a circle of liquid dish detergent around the waterer, or if you put the waterer on a pole, put it on the pole. I use this on the wire that holds my hummingbird feeder and on the cap where it attaches and the ants will NOT cross over it. Also, I have read about making contraptions to provide water for butterflies. Put out a terracotta saucer with sand in it and add water. They stand on the sand and take in the water. I am wondering if this marble idea would encourage mosquito breeding. We have a problem with that. @HereFishyFishy - What's wrong with ants drinking the water too? To "Ants"...personally, I have observed that the hummers won't go to the feeder when ants are on them. As far as the bee waterer, no one wants to deal with ants on everything. But these are just my opinion and thoughts on the subject. The person above my comment asked what to do to keep them off, I was just answering what I do or would do. It works on the feeders, I'm sure it would work as well on the waterer. One must reapply after a rainfall, but it's cheap and easy. Narde (and others) --- Actually, this waterer is envisioned to be just a waterer, not a feeder, so no sugar at all is included. In the summer, honeybees often need sources of water they won't drown in, and this fits the bill. I'm not sure I'd recommend feeding bees unless you were a beekeeper and knew they needed it. If you do feed, you want to use plain white cane sugar --- even though beet sugar and brown sugar may be better choices for people, they're not good for bees. Organic, of course, is better, but probably isn't essential. Brenda --- Colored marbles are a great idea! As long as the color is embedded in the glass, not a coating on the outside. Meaghan --- If you just use water (no sugar), there will be no ants involved. I think this is a wonderful idea, but I was thinking what happens when the water falls below the level of the marbles. If pieces of wood or cork were used (or a combination), then when the water levels drop so do the corks and pieces of wood. I would think that would make it more carefree than filling it four or five times a day. I love the idea of keeping the honey bee population in good shape. We love our little mead makers. However we also have a problem with mosquitoes in our area. Will this same waterer become a breeding ground for the little disease-spreading blood-suckers? I absolutly loved this idea. I used a rlrg rock, but some were still drowning. This idea is perfect! We have an extreamly lrg hive down the street in an old house of our's. It is like they are connected to us, they come to my house for the water and food. Don't want to lose anymore of my little friends, our live's depend on them. How do you keep it from becoming a mosquito colony? You can get marble cheap at a Dollar Tree or other dollar store. About $3 and an old pie/cake pan and you have it cheap! I have just recently read to put Vaseline on the material used to hang the feeder and top of the feeding to keep ants off. I am going to try that. I like this idea, but do you think it will attract yellow-jackets and/or wasps? Great idea, I am wondering if I could use small river rocks or pebbles in place of the marbles? I don't keep bees but do encourage them in my garden. I built an in ground solar powered fountain, lined with pond plastic, and filled with three different sized stones. I did this mainly for myself because I love the look of fountains. Apparently the bees like it too! A very small amount of water rests on top. It's bowl- shaped, and the fountain only comes on a couple hours a day due to mottled sunlight in that area. I have bee visitors drinking from it all day long. I purchased black rocks from the craft area and only the bottom of a clay pot to place the rocks in....works great for birds and bees. When my grandson was younger, he collected marbles. Now that he's all grown up, I have this BIG container of his marbles. I also have 3 concrete water dishes from a mink farm. They're shaped sort of like a single daisy petal with a bit of a dip in the center. I now have the PERFECT use for both the water dishes and the marbles! What a fun way to make bees and butterflies happy! Is it bad for the bees to drink the nectar (red) concentrate in hummingbird feeders? I just read on a nature Facebook page that (Hilton Pond Center...) that beekeepers use a certain % of sugar to water. You may wish to visit the or ask a beekeeper what ratio sugar to water to use. Here is the link -- if you read the comments to this video, especially those by Hilton Pond you can find the ratio beekeepers use of water to sugar. PS Never feed hummers honey. Not that you would. Hi Love the idea of the coloured marbles in the bowl with the water. I have just been using water and stones in my bowl. I have a question. I have a community garden plot. The bees drink it down quickly in the hot weather. I have another bowl at home I used for crafts before. I could have two bowls there. Does anyone know anything about benzoin. I used this when making salt dough sachets. All the ingredients went into a bowl and then you roll it out and cut it with a cookie cutter. One of the ingredients in the bowl was benzoin. It has been washed, but does anyone know if the bowl is safe to use for the bees or should I toss it. Thanks. Your marble filled water bowl is amazing. I will use it with baby rabbits to avoid drowning as they learn to lap from a bowl. It would also be good for baby chicks. I love this idea, and I want to add it to the bee/pollinator friendly garden that I'm planning for my side yard. My question is this: what kind of marbles do you use? I was going to just buy the vase filler type from the dollar store, but then I got to wondering where they were made (China) and whether they contained lead. If so, would the lead leach into the water and actually harm the bees? Do you think polished river stones would work as well as marbles...the bonus being that they would not leach any dangerous toxins into the birdbath water?